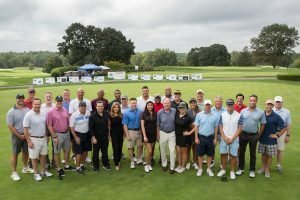 The Broadcasters Foundation of America raised $250,000 to help broadcasters in need during its Celebrity Golf Tournament on Monday at the Westchester Country Club in Rye, NY. The annual event is one of the Broadcasters Foundation’s biggest fundraisers, with 100 percent of the proceeds going to broadcasters in need. This year, more than 150 broadcasters and celebrities came out in support of their colleagues, who due to illness or unforeseen disaster have experienced terrible loss. Celebrity golfers included: WCBS-TV’s Maurice Dubois, Otis Livingston, and Chris Wragge; WCBS-FM’s Scott Shannon; actress and philanthropist Rachel Grant; NBA All-Star Ray Allen and NBA Star Donny Marshall; 1980s Miracle on Ice Star Mike Eruzione; ESPN’s John Anderson and Anita Marks; NY Jets’ Greg Buttle; Voice of the NY Jets Bob Wischusen; and more. Event Chair for 2018 was Tony Chiulli, Senior Vice President, Digital and Political Sales, NBC-Owned TV Stations and Telemundo Station Group. Sponsors included: title sponsor Evercore Wealth Management, ABC Channel 7, CBS Television, Entercom/CBS Radio, NBC Owned TV Stations & Telemundo Station Group, Eileen & Jack Connors, Jr., ESPN Radio, Empire Merchants/Diageo Brands, Flexjet, Katz Media Group, Norman Knight Charitable Foundation, Nielsen, Pepe Auto Group, Putnam Investments, Tito’s Handmade Vodka, and others. The Lee Iacocca Villa Nicola in Tuscany, which was donated by Ned and Kate Hentz, pulled in an additional $20,000 in auction.